Immediately following the event, Joe Jeffreys will be joined by drag star Coco Peru to explore in more depth the cultural legacy of drag and how it is changing today. 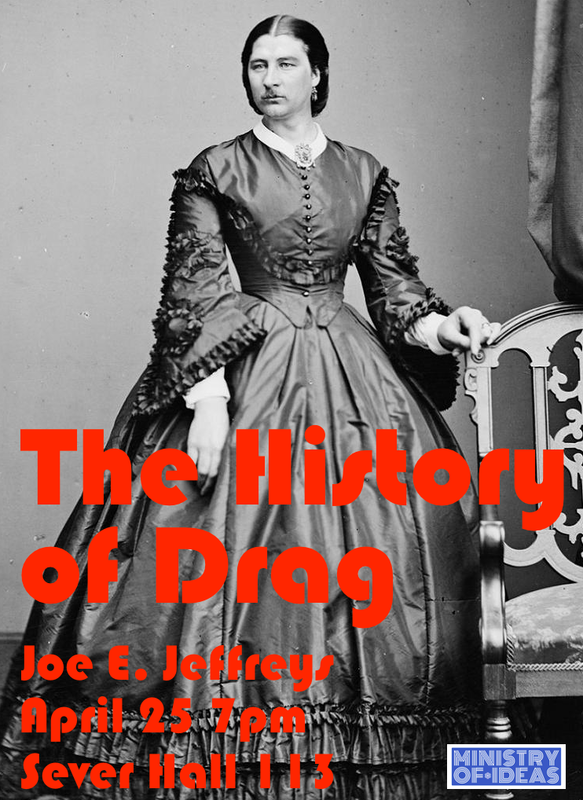 Joe E. Jeffreys is a drag historian. His drag-happy video work has been awarded funding from the Lower Manhattan Cultural Council and the Jerome Foundation and screened at museums, galleries and festivals worldwide including the Tate Modern in London, the Façade Video Festival in Bulgaria, and The Museum of Arts and Design. He has published in book anthologies, encyclopedias, the popular press and academic journals from Time Out New York and The Village Voice to The Drama Review, Theatre History Studies and Women & Performance. Jeffreys has taught theatre studies at New York University’s Tisch School of the Arts Drama Department, Purchase and Stony Brook University. He has served on the board of directors for Dirty Looks, the committee for PS 122’s Ethyl Eichelberger Award and worked as dramaturg for numerous downtown and off-Broadway productions including the world premiere of Tennessee Willam’s last full length play, In Masks Outrageous and Austere.